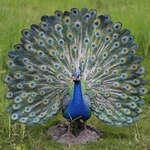 Peacocks are a long-standing symbol for immortality, in part because of their feathers, which never decompose. 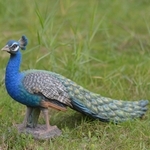 Because our peacock decor and garden ornaments are made with durable, weatherproof materials, they make an excellent icon for immortality in your garden, patio or backyard. 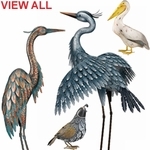 These vibrantly colored peacock garden ornaments are constructed with element-withstanding materials like metal, UV stable paint, beads and glass to give your outdoor green space an added bit of avian charm for the long-term. 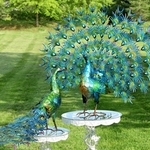 From solar-powered peacock garden stakes to perfect outdoor peacock pillows, this selection of peacock decor items is truly unmatched. 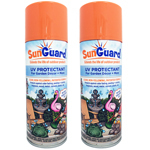 All of our solar garden adornments feature wireless configurations that offer brilliant, colored lighting using an auto-sensor that activates at dusk. 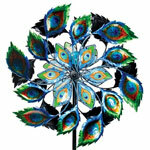 Available in purple and green, the Solar Peacock Stake is embellished with colored acrylic beads and stained glass that brings supreme elegance and attention to detail to an otherwise bland garden or lawn. 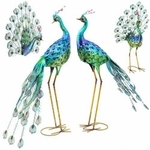 Our best-selling Upright Peacock Garden Statue brings to life the bird�s iconic train and coloring using hand-painted, UV protective paint that mimics the patterning on a real peacock. 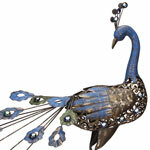 We also keep a well-stocked supply of stunning peacock wall-hangings, wind chimes and free-standing garden ornaments. 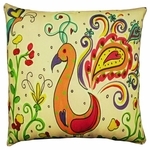 All of these items allow you to celebrate the boldly colored bird wherever you choose, indoors or out. 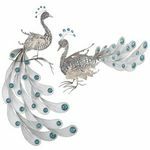 Our graceful glass peacock wind chimes come complete with a top metal peacock design, jeweled accents, glass marbles and distressed bells. We also carry a sweet Springee Spinners Peacock that wiggles and spins in the wind without electricity or power. 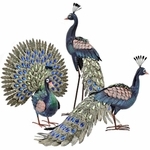 Whether you�re looking for a whimsical garden accessory or something with a dash of rustic charm, these endlessly elegant peacock decorations are designed to bring new life to your outdoor oasis.